NASCAR is relaxing some of its rules this season, and encouraging drivers to show more aggression and emotion, in large part to answer a growing fan sentiment that the sport had gone stale. "There's an age-old saying that in NASCAR, 'If you ain't rubbing, you ain't racing,' " NASCAR President Mike Helton said as the changes were announced Thursday. "I think that's what the NASCAR fan, the NASCAR stakeholders all bought into, and all expect." The first change will be evident when the season opens next month at Daytona International Speedway, where restrictions on bump-drafting will be lifted and horsepower will be increased by the use of the largest restrictor plate since 1989. NASCAR had been slowly tightening its tolerance on bumping at Daytona and Talladega - the two biggest and fastest tracks in the series - and it graduated into an outright ban issued the morning of the November race at Talladega. The edict sucked the drama out of what's typically one of the most exciting races of the year. Even some drivers publicly complained, criticism that is usually frowned upon in NASCAR. 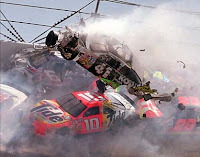 "Let us RACE," Denny Hamlin tweeted at the time, later adding, "We signed up to drive our cars. Not be told how to." Fans were incensed that the rough-and-tumble sport had been molded into follow-the-leader racing, and their favorite drivers had become vanilla. It wasn't until last fall - when Hamlin waged a monthslong feud with Brad Keselowski, and Tony Stewart and Juan Pablo Montoya intentionally wrecked each other in the season finale - that NASCAR finally saw the light.